Dubai — February 14, 2018 — Robinsons, the largest department store in the UAE, has been on the finalists list for the World Retail Awards and was recognized for the 2018’s Outstanding Store Design for stores larger than 1200sqm. For the last ten years, the World Retail Awards have recognized the highest standards of excellence in store design, as well as the very best retailers and retail initiatives across a range of categories. The Robinsons story began on 25 February 1858, when John Spicer and Philip Robinson founded Spicer and Robinson in Singapore. Since then, Robinsons’ pioneering spirit has kept them at the forefront of Asian retail. In 2008, the Al-Futtaim Retail Group took over the operations of Robinsons Department store in Singapore, and successfully led it to become one of the best performing department stores in Southeast Asia. The brand is committed to offering customers an unrivalled choice of the world’s best brands with exceptional standards of customer service and after-sales support. 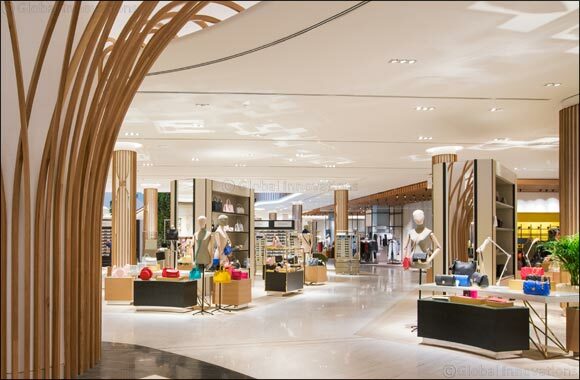 The Middle East’s first edition of the iconic Singapore department store made its debut in late March of 2017 with the launch of the spectacular 20,000 sqm at establishment in Dubai Festival City —the first in a collection of stores to follow in the GCC (Gulf Cooperation Council). The architects, HMKM, drew inspiration from Robinsons’ roots — in particular, from Singapore’s lush terrain and contemporary architecture. That dynamic runs through every aspect of the design, including the dramatic facades that blend vertical gardens by renowned French botanist Patrick Blanc, animated screens and interlacing lines of timber and polished brass. Built around a series of spectacular hero experiences, the store’s design creates a distinctive new identity for Robinsons in the Middle East, celebrating its rich Singaporean heritage while looking firmly to the future. With three magnificent floors of contemporary and designer fashion, beauty, childrenswear and home d�cor, each visit to Robinsons Department Store is more enchanting than the last.